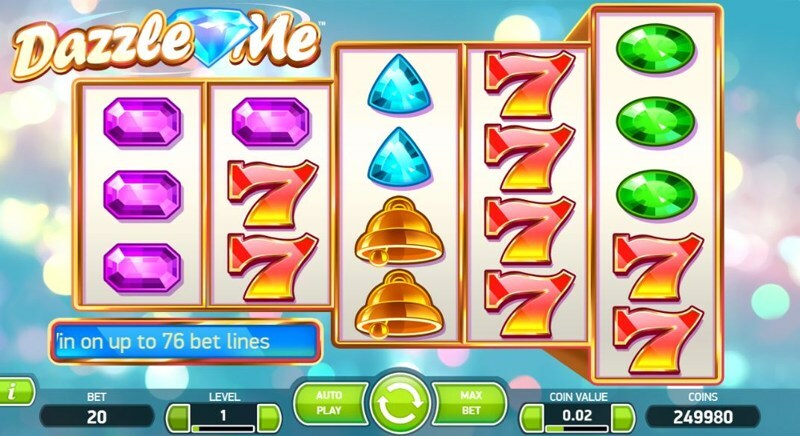 Dazzle Me is a Net Entertainment game, that, like many of their titles, uses a combination of simplicity, with high-quality design to provide players with a high-quality gaming experience. Featuring 5 reels, and 76 pay lines (yes, that’s not a typo; 76 pay lines), the game is a bright, vibrant, and colourful title from the popular software provider, and it’s one of their most exciting Video Slots, thanks to action-packed bonuses and base-game features. One of the first unique aspects you’ll see within Dazzle Me, is that there’s only six symbols on the reels. You won’t see any low paying playing-card symbols; instead, the game uses a mixture of traditional slot-symbols, and game-specific imagery; this presents you with a Bell, a “7”, a Red Gem, a Blue Gem, a Green Gem, and a Purple Gem. There’s also a free-spins symbol, which is used as the scatter symbol within the game. The Dazzling Wild Reels feature is a base-game bonus, and it can be triggered randomly at any time, on any spin. When triggered (after you’ve pressed spin, but before the reel-symbols land), anywhere from one, to five reels can turn completely wild, and this is reminiscent of Microgaming’s Immortal Romance “Wild Desire” feature, which became a BIG hit with players, due to it’s huge potential. Now, unlike the Microgaming hit, Dazzle Me doesn’t use a 243-ways-to-win structure, so there’s not quite as much potential to win, but if you manage to get 3, 4, or 5 wild reels, there’s a good chance you’re in for a big payout. 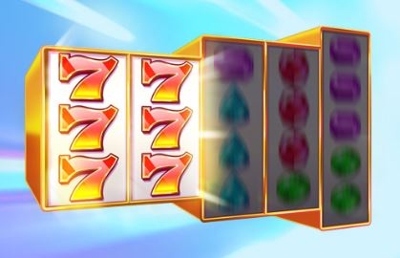 The free-spins bonus is triggered by landing three, four, or five of the scatter symbols, anywhere in view. Three scatter symbols awards you with 8 free-spins, with four awarding 12 free-spins, and five giving you 16 free-spins. Once the free-spins begin, you’ll benefit from Linked Reels, and on each free-spins, you’ll notice that either reels one and two, or reels three and four display, and land identical symbols. This is obviously very profitable when you manage to land a winning pay line, and you’ll never get just singular pay lines – it’ll always be around 15, or more. If you’re a Net Entertainment fan, you may see the similarities between the Linked Reels feature, and another popular Video Slot game; Twin Spin. Twin Spin is a great example of how the Linked Reels feature works, and while it’s not possible to get more than two reels containing identical symbols, it’s a good example to show how it works. 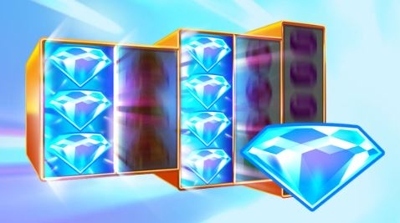 Unfortunately, it’s not possible to re-trigger more free-spins during the bonus itself, and while Dazzle Me is generally seen as a fairly low-variance slot, the bonus can go long-periods without landing, so it’s one of these games you’ll either end up loving, or hating.